Bulgaria fares poorly in terms of the number of adults involved in early-stage entrepreneurial activity. In 2015, among 60 countries measured by GEM, this East-European country had the second lowest rate of adults involved in starting a business (3.5%). It also has one of the smallest percentages of entrepreneurs who start a business motivated by opportunity rather than by necessity. In addition, just 5.3% of adults expect to start a business in the next three years (placing it 59th out 60 countries ranked by GEM on this measure). Few report seeing any opportunities to start a business in Bulgaria (just 15.8%), while just over a third believe they have the capabilities to do so. However, despite this 71.5% of Bulgarians rate entrepreneurship as having high status, while 57.5% believe it to be a good career choice. Also on the positive side, internet connectivity is world class and Bulgaria traditionally boasts a highly skilled IT labour force. Bulgaria has a number of initiatives aimed at boosting the public image of entrepreneurship – for example Start it Smart, an NGO started by students which aims to inspire potential entrepreneurs and provides high quality pre-accelarator programmes, as well as ABLE and StartUP. Bulgaria performs poorly when it comes to entrepreneurship support programmes offered by the government, research and development transfer and entrepreneurship education. However, in 2016 the new Educational Act is set to introduce entrepreneurial education in schools for the first grade. GEM experts rate it relatively favourably for commercial and legal infrastructure and physical infrastructure and low levels of red-tape. Small businesses are still struggling. While value-add by SMEs in 2014 returned to pre-2008 crisis levels, small firms had not recovered jobs lost during the crisis – with employment in SMEs in 2014 at seven percent below the 2008 level. Forecasts predict a further five percent increase in value-add and a moderate one percent rise in employment until 2016. Bulgaria has been able to help about five percent of its small and medium enterprise (SME) population to get funding through an EU-funded initiative which aims to improve the access to finance for SMEs using various financial instruments. The Joint European Resources for Micro to Medium Enterprises (JEREMIE), a European Commission and European Investment Bank initiative implemented by the JEREMIE Holding Fund (JHF), was launched in Bulgaria in 2010 and is financed with €349 million (US$388m) from EU funds. The investment strategy of the JEREMIE initiative in Bulgaria uses a mixture of seed funding, venture capital, private equity, debt and credit guarantee instruments to boost access to finance for Bulgarian SMEs in order to address market gaps between the supply of and demand for financial instruments. Under the initiative, €900 million has been disbursed to more than 9,300 SMEs as of 2016 with the addition of private funds helping to leverage the EU’s initial €349 million almost three times. Most of the finance disbursed to SMEs was by way of credit guarantees and portfolio risk-sharing loans via local banks (credit guarantees helped reduce the amount of collateral that beneficiaries require to borrow from a bank in Bulgaria from 120% to 48%). Smaller amounts of seed funding and venture capital were disbursed via private funds and venture capital funds. The number of SMEs that have benefitted equates to roughly five percent of the country’s active SMEs population in Bulgaria in less than four years. The initiative has provided access to finance to SMEs which otherwise would not have been considered due to the high risk they represent to traditional finance forms such as banks. The initiative also helped put the foundations of a modern venture capital (VC) and private equity eco-system in place in Bulgaria by supporting the launch of five funds. These cover the needs of the entire life cycle of an SME – from preseed funding to seed fund and finance for expansion. Through the initiative, Bulgaria was able to establish the first of its kind acceleration and seed fund model in 2011/12 when the acceleration industry and segment was developing in Europe and especially in Eastern Europe. The two funds established at two accelerators – Eleven and LAUNCHub (both set up in 2012) – have funded close to 200 startups with €21m, the most successful of which have raised a further €20m from third-party investors, turning the capital Sofia into a hotspot for VC activity in Europe. As a result, Sofia was ranked among the top three European capitals for supporting start-up businesses with risk capital for the 2013 and 2014 years and declared the 10th best place in the world to launch a start-up by Forbes in November 2015. By the same month Sofia had the third highest cumulative number of investments by European accelerators since 2004, after London and Dublin. However, despite the deployment of various funding instruments under JEREMIE, the European Commission noted in 2015 that there had been a noticeable deterioration in the availability of bank finance and public financial support. It said the implementation of a late-payment directive should improve Bulgarian SMEs’ liquidity. Text about Bulgaria appeared in the GEM 2017 Policy Brief special report (see Special report section in tab Reports above). In this second annual report of GEM, Bulgaria experts extend a number of new recommendations for policy and practice to complement the list compiled in 2015, which remained largely unfulfilled. Also, we make a special call to two constituencies that appear to be particularly critical for the rise and consolidation of young entrepreneurial ecosystems: media and acting entrepreneurs and managers. ¬	Media are essential for the rise of entrepreneurial intentions because they facilitate exposure to role models and create the verbalisation and the symbols associated with entrepreneurial behaviour. These powerful levers have the potential to alter the notions of hope and faith in society as both of them are symbolic and verbally constructed and as a consequence change the aspirations, confidence and sense of worth and purpose of members of society. In this role, media share an enormous responsibility, which they have not fully accepted and certainly have not lived up to. ¬	The level of business sophistication of Bulgarian companies is low and the associated managerial and leadership practices, in particular, those related to responsibility delegation and inter-firm entrepreneurial initiatives are not sophisticated either. The time has come to openly acknowledge that acting business leaders and entrepreneurs are as responsible for the competitiveness of the national economy as the government policies and their enforcement. Policies and regulations shape the context for business, but it is the labour productivity of the workers and the business sophistication of the firm leaders that determine the ultimate driver of competitiveness in any economic system—firm productivity. It is unlikely to see a huge surge in the scale and quality of entrepreneurship in the observable future unless there is a general improvement in the managerial and leadership practices of those currently in charge. Във втория си годишен доклад GEM българските експерти отправят множество нови препоръки за политики и практики в допълнение към списъка, съставен през 2015 г., който остава в голяма степен неизпълнен. Освен това отправяме специален апел към две групи, които, изглежда, са особено важни за възхода и консолидирането на младите предприемачески екосистеми – медиите и действащите предприемачи и мениджъри. ¬	Медиите са съществено важни за възхода на предприемачески намерения, защото улесняват излагането на ролеви модели и създават вербализацията и символите, асоциирани с предприемаческото поведение. Тези мощни лостове имат потенциала да променят схващанията за надежда и вяра в обществото, тъй като и двете се конструират символично и вербално, и впоследствие да променят стремежите, увереността и усещането за ценност и цел у членовете му. В тази си роля медиите носят огромна отговорност, която не са поели изцяло и определено не са оправдали. ¬	Нивото на фирмена развитост на българските компании е ниско, а свързаните с това управленски и лидерски практики, в частност онези, свързани с делегирането на отговорност и междуфирмените предприемачески инициативи, също не са добре развити. Дошло е време открито да се признае, че действащите бизнес лидери и предприемачи носят същата отговорност за конкурентоспособността на националната икономика като правителствените политики и прилагането им. Политиките и регулациите оформят контекста за бизнеса, но производителността на труда на работниците и нивото на развитост на ръководителите на фирмата определят решаващия двигател на конкурентоспособността във всяка икономическа система – производителността на фирмата. Малко вероятно е да се наблюдава голям възход в мащаба и качеството на предприемачеството в близко бъдеще, освен ако няма общо подобрение на управленските и лидерските практики на настоящите ръководители. Three out of four Bulgarians believe that successful entrepreneurs are important for the society The typical Bulgarian entrepreneur is aged between 35 and 44 years and is particularly wary of recruitment, according to the first annual report of the organization 57.5% of the adult population in Bulgaria see entrepreneurship as a good career choice, while 71.5% agree that successful entrepreneurs enjoy high status. This shows the first national report oof the Global Entrepreneurship Monitor (GEM) Bulgaria, officially presented on 3 October in Sofia. The report includes an analysis of 2,000 interviews with adult citizens across the country by measuring individual activity at the different stages of the entrepreneurial process and detailed information on the levels of each stage, including the phase "intention". Its purpose is to provide policymakers, educators and business leaders information to help them implement specific, practical and targeted recommendations. "In 2015, 15.8 percent of the adult population of Bulgaria stated that there are good opportunities for starting a business in the area in which they live. This result is significantly smaller than the corresponding figures for Romania and Greece, "said Veneta Andonova, author of the report and professor at the Universidad de Los Andes in Colombia. The level of total early-stage entrepreneurial activity (TEA) in Bulgaria was 3.46%, including 1.95% of the adult population engaged in emerging entrepreneurial ventures - in the registration period and another 1.51% - new owners business - over the last 42 months. Regardless of the very low levels of this indicator in the country, a relatively large percentage of these entrepreneurial initiatives survive long enough to become established businesses. "Half of the respondents in our survey believe that entrepreneurship generates regular media interest, which is probably also a good incentive for business development," says CEO of GEM Bulgaria Mira Krusteff. 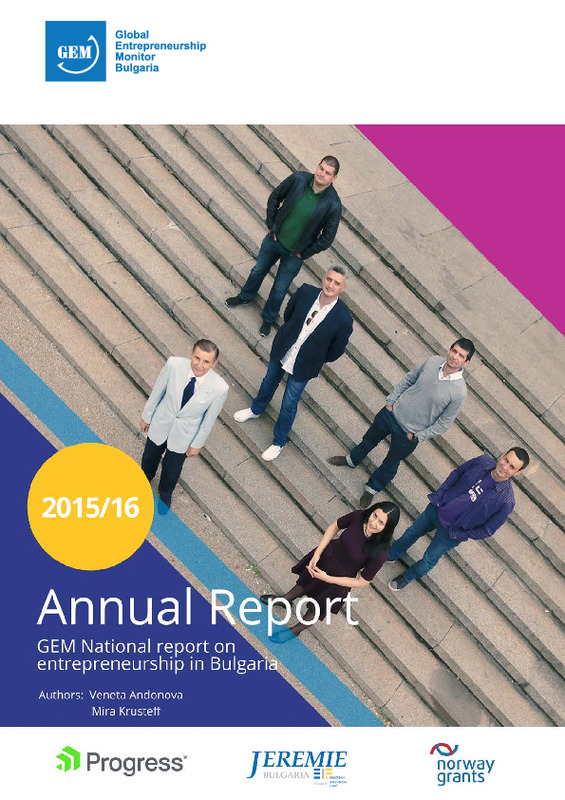 Along with the report, during the Annual GEM Bulgaria conference, the profile of the typical entrepreneur in the country was presented. The most active entrepreneurial age group in Bulgaria turns out to be the 35-44-year-olds, while the group 18-24 accounts for approximately the same levels of entrepreneurial activity. "The level of entrepreneurial activity in early stage among men and women is almost equal, but to feed the Bulgarian economic growth is important to identify those 7% active entrepreneurs in the early phase, which plan on high growth for their business" explained Krusteff. According to data, budding entrepreneurs in Bulgaria are extremely wary of future recruitment, with nearly three-quarters of them not expecting to hire staff, while 20.3% expect to create between 1 and 5 jobs in the next five years. Bulgaria has a small but energetic group of innovation-oriented businesses that utilize innovation remarkably effectively. In fact, this model of "elitist" innovation suggests that there may be a two-tier distribution of the Bulgarian early- stage companies: a small group of innovation-active businesses and another, much larger group of businesses that do not deal with innovation. The real challenge for public policy is then spread innovation culture among the second group to broaden the base of which depends on the international competitiveness of the Bulgarian economy. The most critical constraints to entrepreneurship in the country are the lack of effective entrepreneurship education in primary and secondary schools, government support and initiatives aimed at making entrepreneurship a national priority, according to experts in the national panel of GEM Bulgaria for 2015. According to them, access to finance is also a common obstacle, as it is directly related to the low financial literacy of the early entrepreneurs. The authors indicate, however, that the promotion of entrepreneurship among the age group 18-24 can be extremely effective, especially if their entrepreneurial ventures are compatible with their academic commitments. 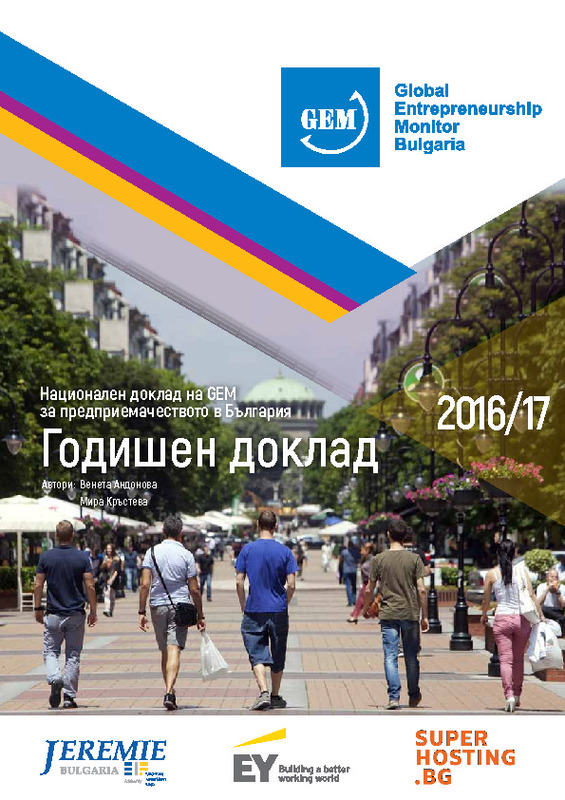 The first GEM Bulgaria 2015-16 Annual report was published in October 2016 in Bulgarian and English language. The report also featured 6 case studies of Bulgarian successful entrepreneurs. Sponsors of the first annual GEM Bulgaria report 2015-2016 are Progress, JEREMIE Bulgaria, and Innovation Norway/Norway Grants.